Life Safety Solutions Emergency Allergy Treatment Training meets the professional education requirement for Florida Department of Health - Application for Emergency Allergy Treatment Certification. The curriculum is pursuant to section 381.88, Florida Statutes and includes the recognition of the symptoms of systemic reactions to food, insect stings and other allergens; and the proper administration of an epinephrine auto-injector. A course post-test will be administered, collected and scored at the completion of each training session. A score of 70% or more is required to pass. This training is for persons 18 years or older who have, or reasonably expect to have, responsibility for or contact with at least one other person as a result of his or her occupational or volunteer status, including, but not limited to, a camp counselor, scout leader, school teacher, forest ranger, tour guide, or chaperone. Designed to give lay persons the education and confidence to effectively recognize symptoms and provide emergency care to a victim of anaphylaxis, including administering an epinephrine auto-injection. 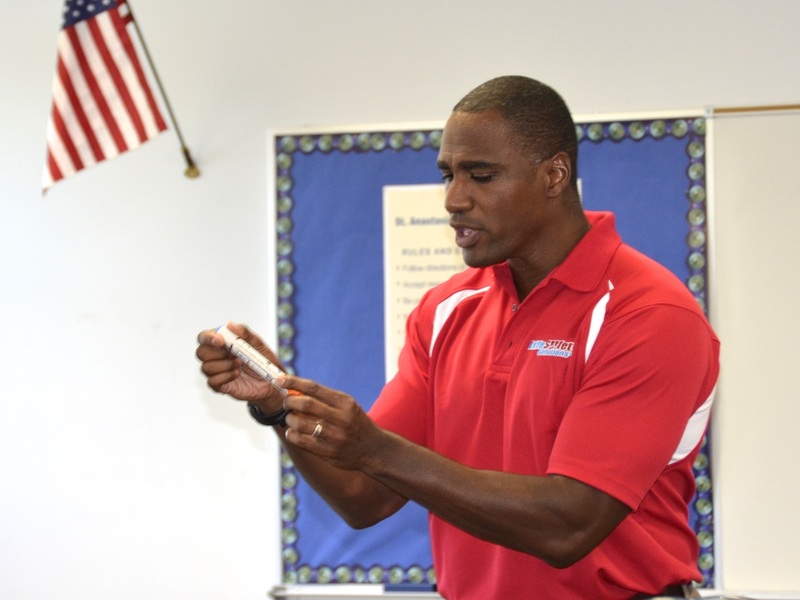 Life Safety Solutions instructor demonstrating adminstration of epinephrine auto-injector during onsite training session. In 2014, Life Safety Solutions, with oversight by our Medical Director created the curriculum and policy for a school district client's Emergency Epinephrine Awareness Program and Training. The program included providing Emergency Epinephrine Training for over 500 school teachers, and working with the risk manager to initiate and incorporate Emergency Epinephrine Policies & Procedures. In 2015, in addition to training and P&P, Life Safety Solutions, in partnership with our client, coordinated the effort to acquire emergency epinephrine auto-injectors to be used by trained personnel, and provided Emergency Allergy access cabinets that were installed at each school. As part of the Epinephrine Management program, Life Safety Solutions provides ongoing Medical Direction, annual training, and annual epinephrine auto-injector maintenance. Life Safety Solutions is an American Heart Association Authorized Training Center, a nationally recognized organization experienced in training laypersons in emergency health treatment. LSS has been an AHA TC since 2003.